However, I found myself with a surplus of beets the other day and decided that a hot pink condiment might brighten up my life. While I was at it, I swapped the nuts for pumpkin seeds and the usual Parmesan for a bit of crumbled feta because I was also taking the opportunity to clean out my fridge. That’s the best thing about pesto. You can throw just about anything into it and almost everything about the formula is negotiable. In my opinion, the best pesto comes from nuts or seeds that have been toasted first, so you can do that on the same pan that you roast your beets on. Trust me, I wouldn’t throw an annoying extra step at you unless it was worth it. 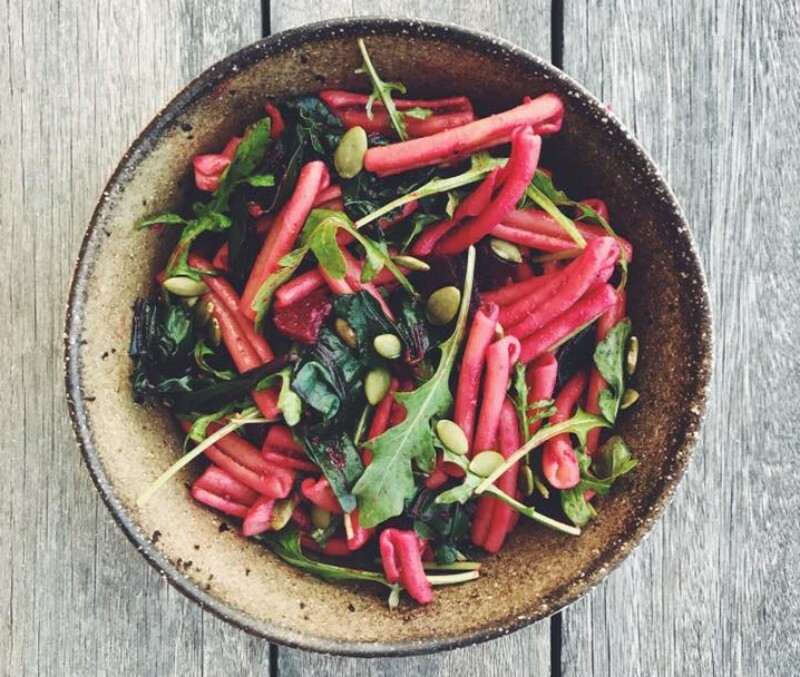 Who knows, you might decide you are too lazy to make pesto and now you have a delicious tray of roasted beets and seeds you can toss on a salad. Remember, making pesto isn’t rocket science, so I’m keeping the recipe loose. Use whatever herbs/nuts/seeds you like. 2. 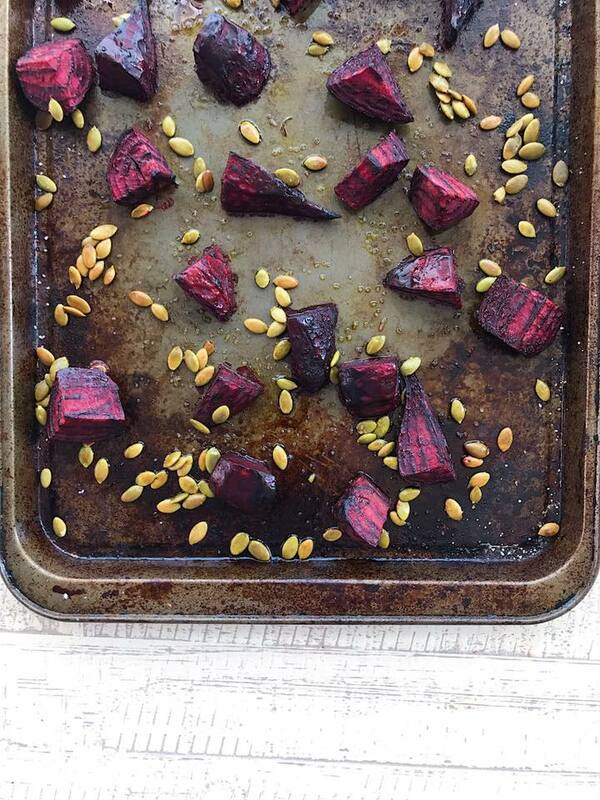 On a large baking sheet, toss the beets and seeds with 1 tablespoon olive oil and 1/4 teaspoon salt. Roast for 25 to 30 minutes until beets are tender; cool completely. In a food processor, combine beets and seeds with remaining 1/4 teaspoon salt, herbs, garlic, and lemon and process on low speed until a coarse mixture forms. With the motor running, add remaining 1/2 cup oil until you reach your desired consistency (thinner for pasta and thicker for slathering on sandwiches or as a dipper for crudité). You might not need all the oil and you might need a little more. Now add the feta and give it a quick whirl. Taste for seasoning and add more salt if desired (I didn’t have to because my feta was super salty). 3. Transfer to a jar or container, cover with a good layer of oil and store in the fridge for about a week. To make the pasta you see below. I reserved some of the roasted beets to toss in along with some blanched beet greens. By: Gabriella VigoreauxFiled under Advice, Food. Tagged Cooking, food, Gabriella Vigoreaux. Bookmark the permalink.